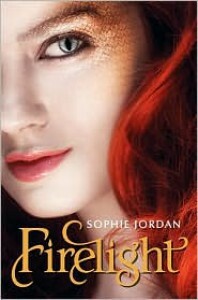 Firelight ranks right alongside a basic fairytale retelling. It's a simple and cute story about love and the struggles that go along with it, but there isn't much new or unusual here. We've seen much of the premise in other recent popular fiction, but the addition of dragons and dragon hunters made the story fun and fresh.I recommend this book for fans of 'true love' or 'soulmates' type fiction. If you're looking for non-stop action, in depth plotlines, or strong female protags, this probably isn't going to be your thing. Taking the book for what it was, I enjoyed it. If I wanted to read something more in depth, there are plenty of other books on my shelf that will fit the bill.